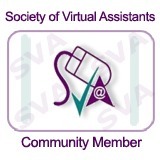 A Virtual Assistant (VA) is a self-employed executive support professional. Working from their own offices, VAs use advanced technology and the internet to provide administrative support to small business owners, executives and other independent professionals/busy people. By using a VA you gain all the advantages of using a highly skilled and knowledgeable professional without having to ‘employ’ them. There will be no National Insurance, PAYE tax, employer insurances, sickness or holiday payments, equipment costs or finding space in your office. In return you get more time to do what you do best – running and growing your business, focusing on strategy and planning, or freeing up your time for a better work/life balance. What are the advantages of using a Virtual Assistant? VAs can support their clients on an ‘as needed’ basis which is much cheaper than hiring a permanent or temporary employee. You only pay for the time your VA spends actually assisting you – there are no long-term contracts, ideal if you need help at busy times or for a specific project. Since VAs are self-employed contractors there are no employee-related costs. As a fellow business-owner, VAs realise the importance of client satisfaction and meeting deadlines, so you can be sure we will be committed to delivering a high quality, timely service. How do I get Cloudburst to work for me? It’s as easy as contacting us using one of the methods detailed here. We will then organise your free initial consultation to agree how we can best work together and decide on the most appropriate package and terms and conditions. We will then send out our Information/Welcome Pack, including the contract for any work agreed, before making a start with the business of supporting you, including keeping in regular contact as the work progresses. How do I get my work to Cloudburst? Use is made of the latest technology as much as possible. Work is generally sent to us via email, Cloud-sharing file software; digital audio files; SMS or telephone calls. If necessary we can always resort to the old-fashioned postal system! Rates vary according to each clients’ specific needs and can be agreed according to per task, per hour or per month. For more information see our Pricing section. How many hours must I sign up for? Other than there being a minimum of a one hour contract, you are not obliged to sign up for any number of hours. Clients will often ‘try out’ a VA by hiring them for one or two projects initially, just to check they are satisfied with the service. It also gives you the opportunity to have a better understanding of the volume of work you may want to ‘outsource’ and whether an alternative package may be more appropriate for you. How do I pay for Cloudburst’s services? Pay as You Go: Payment for these services are invoiced on completion of the work and are subject to payment within 14 days of receipt of invoice. Monthly Retainer Packages: Services provided as part of these packages must be paid for in advance. Payment can be made by cheque, BACs transfer or Paypal. What are the hours of work for Cloudburst VAs? Generally the hours of work are within normal office hours – 9.00 – 5.00 Monday to Friday. However, as we work flexibly, according to client requirements, for specific projects the hours could be planned around your specific needs. What about confidentiality and Data Protection?